To fully understand the power of a great elevator pitch, I first have to come clean with you. After many years of teaching Business English in Korea and China, I returned to an oversaturated ESL / ELT job market, filled with passionate and qualified language instructors who were all vying for the same jobs; yet, I had to compete in an environment where I had no network, no one to sing my professional praises, no advantage of native “Englishness”, and no real understanding of how to sell myself. Six jobless months passed, and I knew it was time to finally take stock. Clearly, it was me, not them and, with this humbling realization, I set out to find that illusive something that gets you remembered and hired. One of the main reasons why so many of us are afraid to use our elevator pitch is because talking about accomplishments is usually an uncomfortable task. However, to be remembered, you must first make yourself memorable. Starts with your first name only, said loudly and clearly. Explains your WHY or your motivation for doing what you do. Explains WHAT you do well and in what specific context. Ends with your professional aspiration. accomplishment – strength – challenged by – inspired – eager – love – passionate about – committed to – impact – powerful – unbelievable – innovative – amazing – unique – effect change –action – advantage – empowering – capable – empathy – expertise. Second, HOW also takes into account your appearance, behaviour, and attitude as you introduce yourself. Though our fashion aesthetic will change based on the job in question, there are 3 facets of first meetings that never change because they are so incredibly central to Canadian culture. These 3 things include a solid handshake, natural eye contact, and a friendly smile. But, how do you develop these three? The answer is simple – practice, practice, and practice some more. We only become good at something after we’ve taken the time to develop our skills in real time. 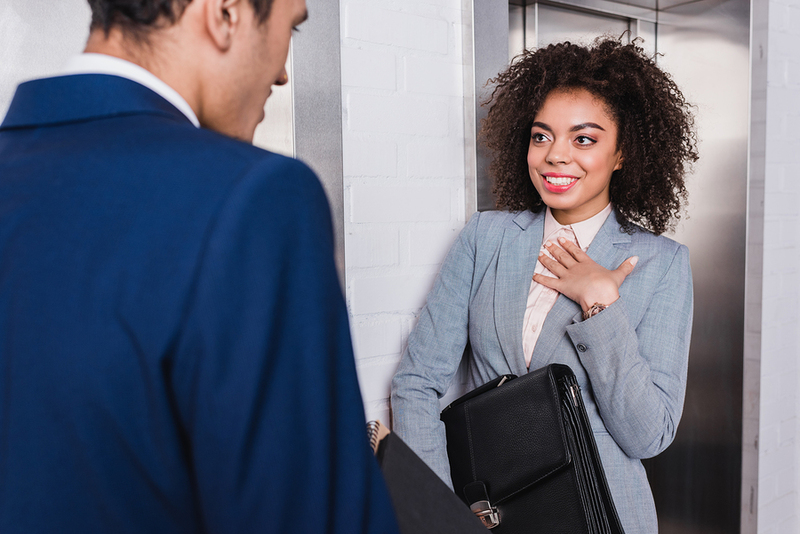 As we come to the end of this blog, I want to highlight that a well-crafted and powerfully delivered elevator pitch is crucial to our professional success. Although it has likely haunted many of us in the past, you CAN and WILL become an expert at selling yourself by focusing on what you say through the formula and positive feel-good language, by using your vocal toolbox as a means to excite and engage your audience, and by confidently shaking hands, maintaining natural eye contact, and flashing your friendly smile. Katina Deichsel is a Business Communication Coach and Curriculum Designer who has been working in the exciting world of English Language Instruction for the past 15 years. Currently working as a Sessional Lecturer at George Brown College and a Curriculum Design Consultant for ACCES Employment and COSTI, Katina is passionate about creating curricula that prepare her clients to be successful in all their personal, academic, and professional endeavors, in Canada and abroad!